One of our most popular! 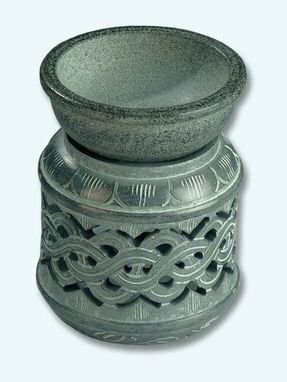 This lovely soapstone lamp is pale green stone, with Celtic knot carvings and a removable bowl to hold your essential oils. Measures 3.5" in height. This would make a much appreciated gift paired with a bottle of favorite essential oil. Review: This is by far the best Oil diffuser that I have tried. I have bought several of them in different places and this is the first one to quickly work with a minimal wear off of the candle, plus it looks great in the room.